Stephanie Plum has a way of attracting danger, lunatics, oddballs, bad luck . . . and mystery men. And no one is more mysterious than the unmentionable Diesel. He’s back and hot on the trail of a little man in green pants who’s lost a giant bag of money. Problem is, the money isn’t exactly lost. Stephanie’s Grandma Mazur has found it, and like any good Jersey senior citizen, she’s hightailed it in a Winnebago to Atlantic City and hit the slots. With Lula and Connie in tow, Stephanie attempts to bring Grandma home, but the luck of the Irish is rubbing off on everyone: Lula’s found a job modeling plus-size lingerie. Connie’s found a guy. Diesel’s found Stephanie. And Stephanie has found herself in over her head with a caper involving thrice-stolen money, a racehorse, a car chase, and a bad case of hives. I decided to go with green font for the fun of it. I just love Stephanie Plum's adventure for those brainless moment and I have a lot of such moments especially when I am stuck at traffic light. That's why I have been bringing Stephanie with me whenever I ride and when I am at the traffic light the same side of red, out she comes to keep those moment more pleasant. I can managed about four to five pages each time although sometimes, it's less but whatever it is, Stephanie is great company during those moments. 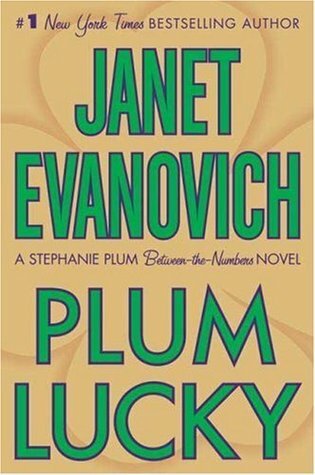 That say, Plum Lucky is an in between the numbers novel and if not mistaken it's between book thirteen and book fourteen. The sequence doesn't really matter when Stephanie Plum's adventures are concerned. You can actually read it in any sequence and still be entertained.